Belina's Adventures: A World Away..... Sinhalese Cuisine (Sri Lanka)... Amazing! A World Away..... Sinhalese Cuisine (Sri Lanka)... Amazing! Just the mention of the name "Sri Lanka" brings exotic images to my mind. Visions of blue ocean waters and palm trees, friendly smiling people and wonderful food. A rich country with exuberant vegetation, having been called "the Garden of Eden" by the Portuguese who first colonized this island of the coast of India. Formerly named "Ceylon" and now known as Sri Lanka. Sri Lanka has long been renowned for its spices. In the 15th and 16th centuries, traders from all over the world who came to Sri Lanka brought their native cuisines to the island, resulting in a rich diversity of cooking styles and techniques. Lamprais--rice boiled in stock with a special curry, accompanied by "frikkadels" (meatballs), all of which is then wrapped in a banana leaf and baked--is a Dutch-influenced Sri Lankan dish (doesn't have much Dutch according to me b ut is a great dish). Dutch and Portuguese sweets also continue to be popular. British influences include roast beef and roast chicken. This was one of THE stops along the spice route and of course means that travelers from all nations were interested in what Ceylon (at that time) could offer. Renown for it's cinnamon plantations, turmeric, cardamom, cloves, nutmeg, black pepper, curry leaves and powder, pandanus leaves, fresh chilies, garlic, rubber, coconuts, tea and coffee - which are all local crops; fruits, a rich and very old culture dating back to before the 3rd Century leaving many holy sites, some which are still revered by the Hindus, Buddists and Muslims which inhabit this area. Unfortunately, there has been civil strife for 30 years and along with the chaotic organization of the country, much akin to the Indian ways, makes foreigners think twice about visiting this lovely country. Since the terrible Tsunami that caused severe devastation in 2004, the island has been quietly coming back from the tragedy in typical Sihnalese manner: helping each other, looking to the future and keeping a positive attitude. They call this "the road to Goodness", something we could all adopt surely. Many of the countries inhabitants, those that did not decide to remain on the island, have settled in Australia, Canada, and the UK for the most part, bringing with them their rich religious and culinary traditions and willingly sharing their knowledg e.
Sri Lankan food has long been known for spices and exotic flavors. Curries and Sambhols (usually hot but toned down for Western palates, served with rice, chutney and pappadam. All served at once, like a buffet): For breakfast it's hoppers or string hoppers that are popular (hoppers are a wafer thin crepe thing with an egg which are then filled with spicy meals, rolled and eaten / while string hoppers are very thin spaghettis run through a sieve, steamed and served with curry), lamprais (is rice boiled in beef stock then beef and veggies are added and it's all put inside a banana leaf and steamed) and rot tis (a street food where a pancake is fried while being cut up with veggies, onions, egg, beef or chicken and then topped with curry served car side by waiters who offer more curry as a topping, really super!). 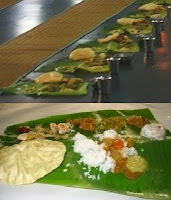 Food is usually served on banana leaves and eaten with only the fingers of your right hand, except in the cities where the use of silverware is now the norm. Of course there are more varieties of foods on the island, fruit dishes, desserts, side dishes, but we'll stick to the main ones for now. Place the cashews in a bowl, add boiling water, cover and soak for about 4 hours or overnight. 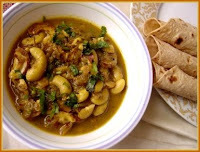 Drain the water from cashews and add salt, turmeric, raw curry powder, goraka and mix well until cashews are well coated. Heat the oil in a medium saucepan then add onions, green chilies, crushed garlic, cinnamon and fry until onions are soft and golden brown. Add the cashews and keep stirring until well coated with oil and onions. Add thin coconut milk, cover and cook on slow heat until cashews are soft and cooked. Add the thick coconut milk and bring to a boil on slow heat.Turn off heat. Adjust salt to taste. Heat oil in saucepan. Add crushed ginger, garlic, curry leaves, rampe, cinnamon, sliced onions and green peppers. Keep mixing the ingredients until the onions are soft. Add salt, turmeric, raw curry powder, ground mustard and Maldive fish. Mix all the ingredients well and add pineapple pieces. Keep mixing the pineapple pieces until well coated with the spices. Reduce heat and allow to simmer for few minutes. If using canned pineapple add 1/2 of the drained juice. Allow to simmer for few more minutes longer. Add the sugar, mix well and adjust salt. Taste and if necessary add a little lime juice (depends on the pineapple used). Add 1/4 cup coconut milk (or fresh milk). Let simmer for a little while and take off heat. Sprinkle yeast over warm water, stir to dissolve, add sugar and leave for 10 minutes or so. If yeast starts to froth it is active and you can proceed with the recipe. If it has no reaction, start again with a fresh batch of yeast. Put ground rice, rice flour and salt into a large bowl. Combine 300 ml (10 fl oz canned coconut milk with measured water and add yeast mixture. Stir into dry ingredients to form a smooth, thick batter. Allow to stand overnight, or put in a warm (turned off) oven for 1 hour until the mixture rises and froths. The batter should be of a thick pouring consistency, but thin enough to cover the sides of the pan with an almost transparent coating when the batter is swirled. It will probably be necessary to add extra water. A little practice will tell you when you have achieved the perfect consistency, and so much depends on the absorbency of the flour (which is variable) that it is not possible to give an accurate measurement. Heat the pan over low heat until very hot, rub the inside surface with a piece of folded paper towels dipped in oil, or spray with one of the light oil or non-stick sprays and pour in a small ladle of the batter. Immediately pick up the pan by both handles, using potholders, and swirl it around so that the batter coats the pan for two-thirds of the way up. Cover pan (any saucepan cover that fits just inside the top edge will do) and cook on very low heat for about 5 minutes. Lift lid and check. When the upper edges begin to turn a pale toasty color, the hopper is ready. Where the batter has run down the sides to the center there will be a little circle of spongy mixture, rather like a crumpet, while the curved edge is very thin, crisp and wafer-like. With a curved slotted utensil or flexible metal spatula, loosen edges and slip the hopper from the pan on to a wire rack. Wipe pan again with oiled paper and repeat. Serve the hoppers warm, accompanied by a hot chili, Maldive fish and onion sambal or any kind of meat, fish or chicken curry. Note: The remaining undiluted coconut milk, with a pinch of salt and teaspoon of sugar added, is usually spooned into the center of the last few hoppers which are made. This is a special treat, known as miti kiri appe or coconut cream hoppers and may be served with shavings of jaggery. If making egg hoppers, before you cover the hopper, drop a whole egg into the center of the hopper, cover and when done remove, fillings are then put on top of this. 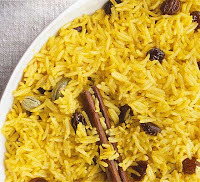 Yellow Rice.- A festive dish usually served on special occasions accompanied by chicken or fish curry and a variety of vegetable dishes and relishes such as hot eggplant salad and cucumber salad. Wash rice and leave to drain. Heat ghee in a heavy bottom pan and saute garlic, ginger, sliced onion, curry leaves and rampe leaf until fragrant, and the onions are translucent. Add the rice and stir until the grains are well coated with the ghee. Pour in the water and milk and add the turmeric, peppercorns and spices mixing lightly with a wooden spoon. Bring to a boil, and cook uncovered until the water recedes to the level of the rice. Then cover and cook on low heat until the grains are soft but not mushy. Fluff up rice with a fork lightly, and transfer rice to a platter. To garnish, saute cashews and raisins slightly with a little ghee, and toss over rice. Fragrant Chicken Curry.- Another example of fine Sinhalese cuisine you will enjoy! Easy preparation once you have all the ingredients ready. Mix spices with chicken and allow to rest for a at least 30 min. Then add water and cook over moderate heat for about 20 minutes until chicken is cooked. Heat oil in another pan and fry seasoning ingredients until fragrant. Then add chicken and saute until pieces are slightly browned and well coated. Add coconut milk and cook uncovered until sauce is thickened. Adjust seasonings to taste adding more salt if required.